The rabbis of the Agudath Israel of America—the major orthodox Jewish community organization—have issued a Jewish legal ruling warning Jews not to take out loans with America’s largest mortgage lender, Quicken Loans, because it is owned by Jews and Jews are only allowed to charge non-Jews interest. 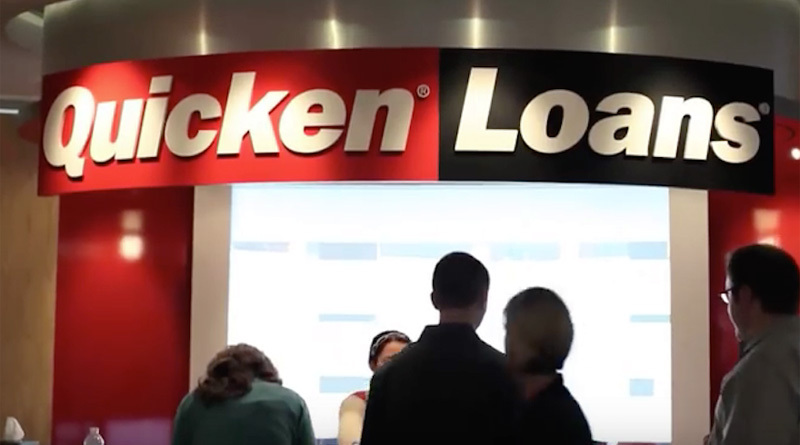 If you’re an Orthodox Jew with a mortgage from Quicken Loans, you might be in trouble. Agudath Israel of America, a major haredi Orthodox organization, issued a Jewish legal ruling last month prohibiting Jews from taking out loans from the Detroit-based company because it is majority-owned by Jews. Quicken Loans, which claims to be America’s largest mortgage lender, also owns Rocket Mortgage, the online mortgage agency. Daniel Gilbert, born to a Jewish family, is the owner of Quicken Loans and the Cleveland Cavaliers. Jewish law, known as halacha, forbids Jews from charging interest to other Jews. So Jews are allowed to own mortgage agencies — and lend to non-Jewish customers — but they are not allowed to sell fellow Jews a 30-year fixed rate (or anything else). Likewise, if you’re a new Jewish homeowner, halacha says you are not allowed to take out a mortgage with a Jewish-owned company. The same also goes for other kinds of loans. Quicken Loans, which is America’s largest mortgage lender, also owns Rocket Mortgage, the online mortgage agency. “Likewise, if you’re a new Jewish homeowner, halacha says you are not allowed to take out a mortgage with a Jewish-owned company. The same also goes for other kinds of loans,” the JTA article explains. “Prominent leading halachic authorities have issued a [ruling] that any Jew who obtains a loan with interest from Quicken Loans or any of its subsidiaries is in danger of transgressing the prohibition of Ribbis D’oraisa,” said the Agudath Israel ruling, using a Hebrew term for the biblical commandment against interest. In the Middle Ages, rabbis devised a contract called a “heter iska,” or business permit, that technically transforms the loan into a co-investment. Instead of being a lender and a borrower, the two parties are now “business partners,” where one supplies the capital and the other uses it as they see fit. 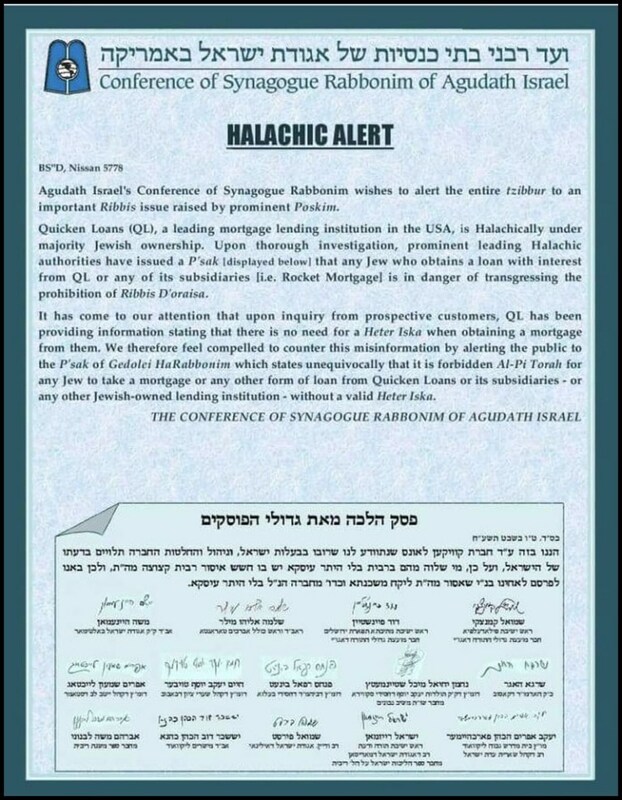 Agudath Israel says Jews can keep using Quicken Loans — that is, if they sign a heter iska. Quicken responded to a query saying it was open to the idea. “Over the next 30 days, Quicken Loans will assemble a committee to quickly and efficiently dive into the issue of ‘Heter Iska,’ and once and for all attempt to find a solution that the observant Jewish community, as well as our legal and capital markets team, finds acceptable. 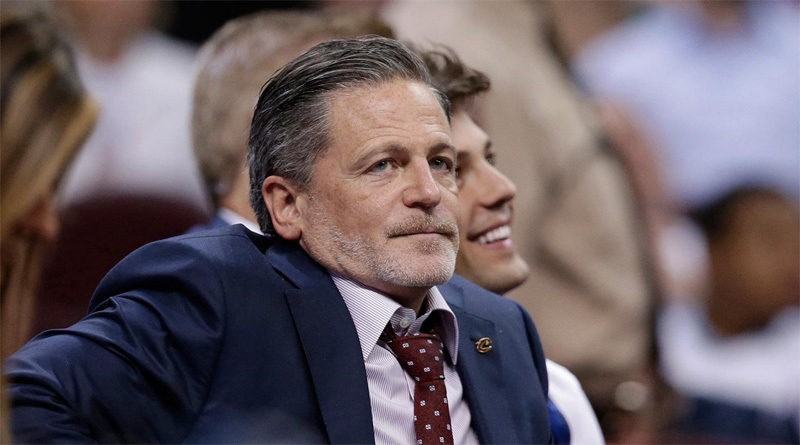 I am confident that this can and will be achieved,” said a statement attributed to Dan Gilbert, chairman of Rock Holdings, Quicken’s parent company. Gilbert also owns several sports franchises, including the Cleveland Cavaliers. 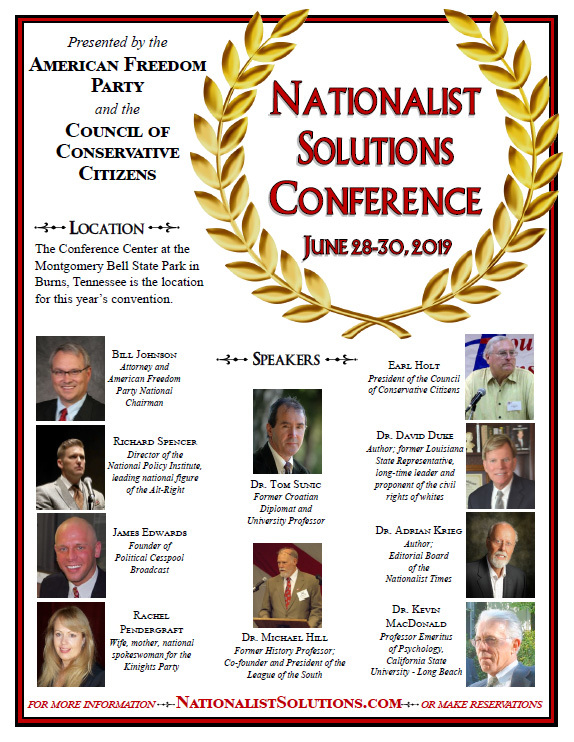 “The rabbis of the Conference felt an obligation to let the public know… that loans can only be taken out from the company with a valid hetter iska,” Agudath Israel’s spokesman, Rabbi Avi Shafran, wrote in an email to JTA. Rabbi Mordechai Frankel, director of the Institute of Halacha at Star-K, a kosher certification agency, said some smaller Jewish-owned banks are familiar with using the heter iska. The Jews thrived in pagan Rome, and ostensibly the Jewish merchants were on the side of the Goths because the Roman and Byzantine Christians were outlawing usury. The Byzantines ultimately prevailed, and the Jews were virtually excluded from openly practicing usury with Christians in Europe for a thousand years, until the 5th Lateran Council made usury legal once again, under a crypto-jew De Medici pope. The Protestant Reformation soon followed, and the German Reformers forbid usury again, however the resulting 30 Years’ War led to greater financial freedom for jews. That war was fought for reasons deeper than what appears on the surface. Jews were comfortable in pagan Rome, among pagan Germans, but were always struggling against Christians.